Bring Your Cat to the Vet Day! Did you know that only 50% of cats visited their veterinarian in the past 12 months? The percentage of dogs that saw their veterinarian over the same period was 78%. Many cats only see their vet when they are sick. The fact is, wellness exams are an important part of cat ownership. During these appointments, your veterinarian will perform a routine physical exam which can uncover early signs of illness or disease. Cats hide their illnesses. As a part of their natural instinct to protect themselves from predators, cats will hide that they are in pain, ill, or in a weakened state. This means that as a pet owner, you may be kept in the dark about illness until it is advanced and more difficult to treat. Multi-cat household. If you have more than one cat, it is difficult to assess changes in water and food consumption, as well as bowel movements and urination. If you have an outdoor cat, these changes are even more difficult to observe. An ounce of prevention is worth a pound of cure. Taking your cat for regular wellness checks allows your veterinarian to see subtle changes and abnormalities that can easily be overlooked – veterinarians are trained to spot problems early. Spotting and treating problems early, before they are difficult to treat, can translate into better outcomes for your cat – and your pocketbook. More than 50% of cats in North America are overweight or obese. Many health conditions, such as osteoarthritis, joint damage, diabetes, heart disease, and cancer, are linked to obesity. Your veterinarian will check your cat’s weight and provide you with guidance on achieving and maintaining her ideal weight. Cats age more quickly than humans. A one-year-old cat is equivalent to 15 human years of age and a two-year-old cat is approximately 24. Each year thereafter is about 4 years. A lot can happen or change in a “cat year,” so taking your cat for regular wellness checks is important. The frequency of these checks depends on the health status of your cat. Your veterinarian will recommend a schedule with your cat’s best interests in mind. 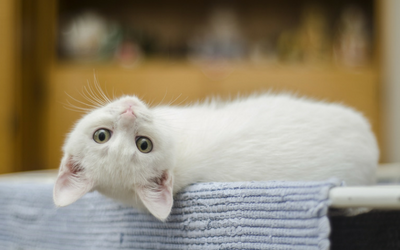 Getting your cat to your veterinarian may seem challenging, but taking some steps ahead of time will help make this easier for both you and your cat. Train your cat to like her carrier by making it tempting! Put her favorite toys, blanket, and treats in the carrier so she becomes accustomed to it. Choose a carrier with a removable lid – once at the clinic, the lid can be popped off and your cat gently lifted out rather than forcibly pulled out. The clinic. Many veterinary clinics have procedures to help keep cats calm and happy. Check with your clinic to see how your veterinary team can help make the visit as smooth as possible. No one really likes going to the doctor, but regular wellness checks can prevent illnesses, detect early illnesses, and keep your cat a healthy member of your family for a long time! This August 22nd, make an appointment to bring your cat to the vet!